Win-win authority dynamics applied to relationships between parents and children. Includes practical strategies and tips for avoiding conflict, engaging cooperative behavior, building responsibility, setting boundaries and following through, and supporting children’s emotional needs. Appropriate for parents, grandparents, foster parents, and other caregivers of children of all ages. Parents learn how to offer choices to help their children build responsibility, honor commitments, and take charge of their own behavior. Parents discover how to use boundary-setting to avoid conflicts with children, to encourage responsibility and self-management, and to resolve and prevent problems. Parents learn constructive, supportive responses to help their children when deal with emotional issues and problems. In this bonus video, parents see how Hickory Elementary School in California succeeded in reaching out to parents, gaining their support, and earning the national PTA award for having the best parent involvement program in the country. The four programs in this package can be shown individually or in combination depending on the available time. Package includes four programs approx. 20 minutes each, on one DVD. $119.95. Please note that since this product is now produced exclusively on DVD, the packaging may appear different than in the image above. Use your credit card or PayPal account to order the video series Win-Win Parenting through a secure server online. 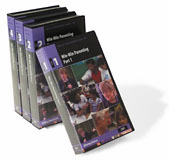 4 DVDs with tips on offering choices, setting boundaries, dealing with feelings, and school involvement.